Ropes Plus mod is now officially updated to Minecraft. 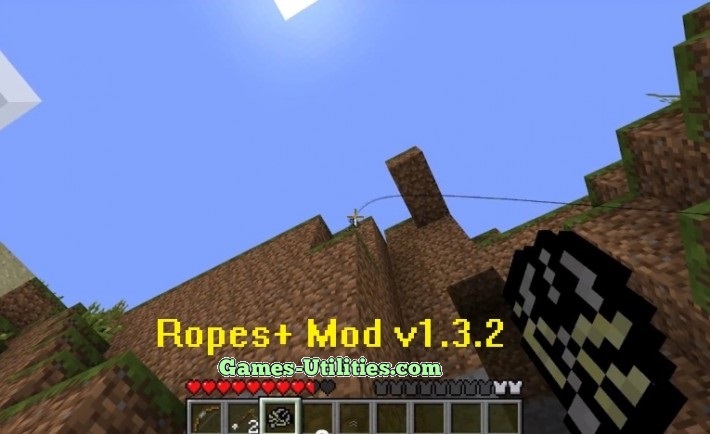 Ropes+ is a modification that adds ropes in your Minecraft for climbing purposes.You can craft the bow, arrow so you can shoot the Grappling hook on any high destination, it will form a rope through which you can easily climb flat surfaces. – Download and install Minecraft Forge. – Press WinKey+R and type %appdata%/.minecraft/mods and hit enter. – Download the Ropes+ mod zip file from the link above. – Drag and drop it to the mods folder. – Requires Minecraft Forge Universal in order to work. – The maximum length of rope is 32. – Ropes+ is SMP compatible. – You can recover the rope/grappling hook by punching it.